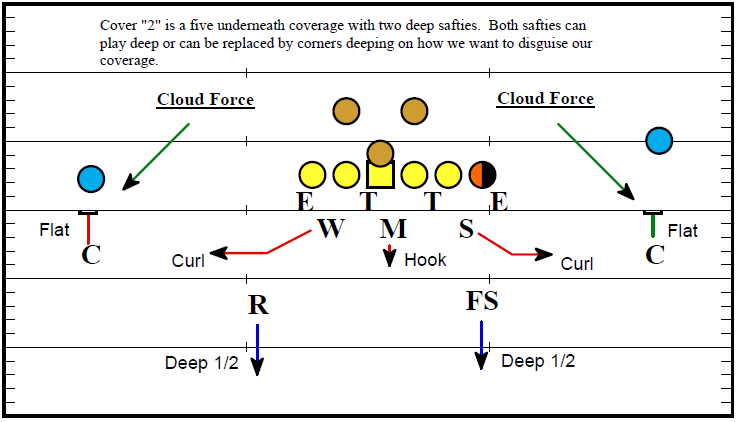 Cover “1” puts the Free safety in a position too be free to help support the deep ball or support alley play on runs. Both Sam and Rover will have number two receiver to their side. Depending upon the type of Dog called will determine who has contain. FS must make trips adjustment to three receiver side. Defensive Strength: Good pressure defensive scheme that allows the potential for seven rushers depending upon the offensive formation. Allows for deep middle coverage by the Free Safety. Good secondary coverage call for short and medium routes. Good coverage for out routes. Defensive Weakness: Underneath coverage and crossing routes. With both linebackers on a dog the screen plays could poss potential problems. Possible mismatch putting linebacker on backs who flare to their side. Cover “2” puts the Free Safety and Rover playing deep halfs. Two deep puts the safeties playing 10 to 12 yards off the line of scrimmage. 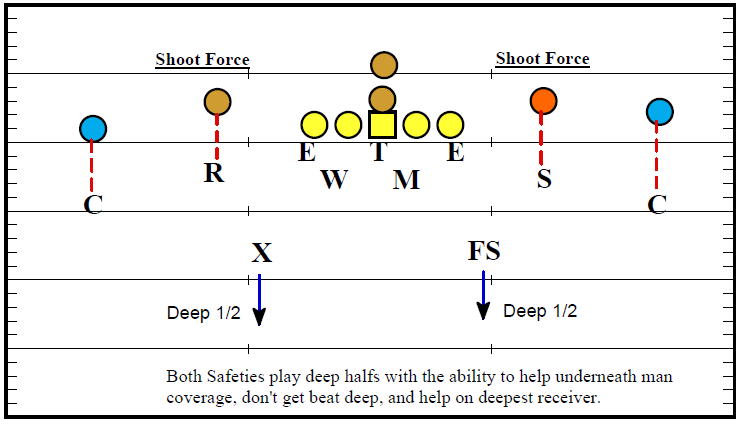 Safeties will stay as deep as the deepest receiver in their 1/2 of the field. Safeties will read routes of the receivers and quarterbacks eyes, when the quarterbacks shoulders turn then break on the ball. Linebackers: After ball has passed last threat of draw, drop to short middle zones (hook to Curl) 8 to 12 yards deep. Keep head on a swivel looking for receivers coming into your zone, collision any receiver through your zone if possible. Break on quarterback’s turn of his shoulders. Defensive Strength: The Corners have the ability to bump outside receivers and have contain responsibility. Good coverage for run offenses and also for covering the short routes. Allows good underneath coverage because of the five defenders in underneath coverage. Good coverage vs seam routes also a good defense vs the option game. Defensive Weakness: Only have two deep defenders, hard to defend four verticals and corner routes. Linebackers: Mike and Will have running back that shows to their side. Defensive Strength: Gives the ability to double cover certain receivers. Easy to diquise this coverage and great for deep help. 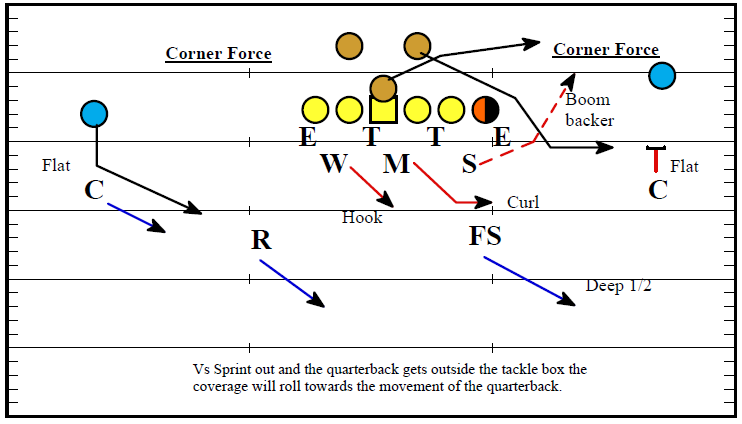 Cover “2” vs sprintout will put the secondary rotating towards the side the quarterback sprints to. Linebackers: After ball has past last threat of draw, drop to short middle zones (hook to Curl) 8 to 12 yards deep. Keep head on a swivel looking for receivers coming into your zone, collision any receiver through your zone if possible. Break on quarterback’s turn of his shoulders.